Wheat was Ricky Brennan, Brendan Harney, Scott Levesque and Me, Kenny Madaras. First, there was Scott and Brendan. Then there was Scott, Brendan and Mike Flood. Then there was Scott, Brendan, Mike Flood and Kevin Camara. Then there was Scott, Brendan, Mike, Kevin and Ricky Brennan. Then there was Scott, Brendan, Mike, and Ricky. Then there was Scott, Brendan, Mike, Ricky and Me, Kenny. Then there was Scott, Brendan, Ricky and Me. Then there was Scott, Brendan, Ricky, Tony Amaral and Me. Then there was Scott, Brendan, Ricky and Me. Then there was Scott, Brendan, Ricky, Rick Lescault and Me. Then there was Scott, Brendan, Ricky and Me. We recorded in Scott's bedroom. We went to London. Our rehearsal space was flooded and we didn't play for a month or two. We recorded with Dave Auchenbach in Providence, RI. We didn't play in Detroit. We took an overnight casino ferry to play in Nova Scotia, where we saw God Speed You Black Emperor. We bought hats in Texas. We were Gerl when we played at Mama Kin. We played at Chris Seekell's birthday party. We recorded during the winter with Dave Fridmann, and Michael Ivins. We drank tea and had toast with marmite upstairs from the art gallery in Pittsburgh. I don't think anyone liked it when we only played for 20 minutes in New York, and Scott and Brendan literally argued on stage. We drank with the Grifters at Princeton, and they thought I stole their whiskey. We mixed our first record, Medeiros with Brian Deck at Kingsize in Chicago, and Mike was always on the phone. Now Wheat is Brendan, Scott and Ricky. Wheat recorded their second album, Hope and Adams, at Tarbox Road Studios in Cassadaga, NY. The record was co-produced, recorded and mixed by Dave Fridmann , assisted by Michael Ivins, and mastered by Jeff Lipton. Back in August 1998, when NME made WHEAT's debut European release their Single Of The Week, the news was so unexpected that their local paper back in Massachusetts ran a news story about the award! Although their album Medeiros had already been released in the US, it had been largely unheralded. But the limited edition 'Death Car' seven inch - issued on London's Easy!Tiger Records - sold out within a week, and when Medeiros was finally released in the UK it was greeted with rapture. Little was known about the (then) four piece from Taunton, Massachussetts. They weren't really into doing interviews. There was no bio as such. Their album contained no information apart from a track listing and a series of numbers (whose significance is still unknown). To the band, none of this information seemed relevant, especially since they weren't even sure whether they would make a second album. But they did. And it is likely that you won't hear a more emotive and subtle record all year. Like Medeiros, HOPE AND ADAMS takes a little time to reveal itself, but only a little extra effort opens the mind to unforgettable melodies and what British daily newspaperThe Independent memorably described as 'lazy brilliance'. It's in the way that Scott Levesque lifts a line like 'Your love is a parking lot' into the realms of poetry, or the way that 'Who's The One' opens with delicately picked chords which then ease effortlessly into a blissful mantra within four minutes. It's in the way the drums kick back half way through 'Off The Pedestal', and in the way the piano creeps into the coda of 'Body Talk (Part One)'. If you need one single instance of the brilliance of WHEAT, however, settle for 'Don't I Hold You', as sublime a song as one can hope to encounter, and one that is destined to seal itself forever into the hearts of all who hear it. Although WHEAT are far from one of those bands with nothing to say, they have the confidence (and the songs) to let the music persuade you first. Produced by Dave Fridmann (Mercury Rev, Flaming Lips, Mogwai), HOPE AND ADAMS is full of the kind of songs that most bands spend a lifetime trying to write. On top of that, the recorded versions only hint at what awaits audiences. Live, WHEAT perform as an ensemble rather than a band, with a chemistry that allows songs to develop and flourish in the most passionate fashion. Their two UK shows so far saw them perform in a circle, feeding off each other's off-the-cuff interpretations of songs to an ecstatic response from two packed audiences. It was in fact these two shows that convinced them that the live experience was worthwhile. Until then, shows had been sporadic and few and far between. There is a charisma in their understated delivery as well as in the band themselves that touches all who come into contact with them. There's no rock 'n' roll excess here, no cheap thrills or fancy frills, but instead a magical quality that defies description. Maybe it's the way the band choose to let their mistakes become part of the band's reality, or the way they're prepared to let a song run its natural course, whether it be ninety seconds or six minutes. Maybe it's the vulnerability of Scott Levesque's vocals, Brendan Harney's restrained drumming, Ricky Brennan's gorgeous guitar lines, the subtle dynamics overall... whatever, it's effective, to say the least. WHEAT was formed by college friends Scott Levesque and Brendan Harney. The two were joined by Ricky Brennan and they began to explore recording. They prided themselves on using the cheapest equipment they could find. Their first kick drum was bought at a Salvation Army. Touring wasn't something they thought a lot about or particularly enjoyed. In fact, they only played about a week's worth of dates in support of Medeiros. HOPE AND ADAMS won't blow you away. WHEAT won't take you on a dark journey into the innermost psyche of pre-millenial angst. They certainly won't flash their washboard stomachs at photographers. They probably won't even remind you of anyone in particular. 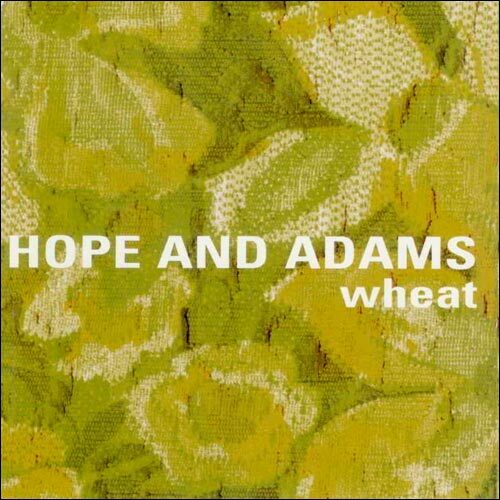 But over the course of time HOPE & ADAMS will become one of those records that you don't know how you did without. If you can come up with one record more poignant, more expressive, more memorable, more moving, more riveting, more delicate, more honest or more glorious, then we want to know what it is. Because it is our deepest belief that records like this don't come by very often.